For the past several months I have been studying the book of Jonah. It has been an eye-opening and heart-warming (to use some Wesleyan terminology) experience. There is the Jonah I remember learning about in Sunday School and now the Jonah I'm re-learning. For the most part what I remember of the story of Jonah still stands true, but what I've discovered about the person Jonah is a whole new story. He is quite a character. I always thought Jonah was running away from the LORD because he didn't want to accept his call to preach, turns out he didn't like the people God called him to go and preach to. 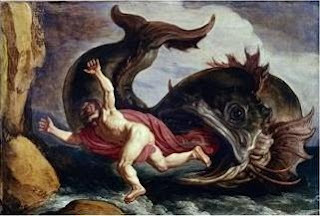 - The book of Jonah falls into the category of the Minor Prophets. There are 12 of them. 8 of the prophets prophesied before Israel went into captivity, 1 while they were in captivity, and 3 when they returned to their land under the Persian king Cyrus. - The book of Jonah falls in with the 8 that were before Israel was captured and taken into captivity by the Babylonians. 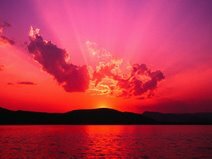 - When God called Jonah to go and preach in Nineveh, things were going very well politically for the northern kingdom of Israel. There was a lot of political zeal in the land. Their leader, Jeroboam II helped restore the land to what it was under King Solomon. So, many of the Israelites at this time were a happy group of people. They were proud to be Israelites. Who knows? They may have even had a great health care plan that everyone was happy about. It was good! - However, things were not going well spiritually for them. Underneath all the patriotism the poor were being oppressed and betrayed by their own government. 2 Kings 14:24 says Jeroboam II did “evil in the sight of the LORD”. It also says he didn’t repent of the sins of their former leader (Jeroboam I), which was idolatry and abandoning God. Jeroboam II oppressed the poor and hoarded wealth for himself. His government was corrupt. So, it was not a good situation for every Israelite living in the northern kingdom of Israel during this time. It was a really dark time in Israel’s history. That usually happens in a country when you have no one seeking God and people worshiping idols. - And it just so happens that during all of this the Israelites enemies, the Assyrians (which is who the Ninevites are), were loosing some of their power and beginning to fall apart and unravel. This was a big encouragement to the Israelites. It was all very good and wonderful to them that their enemies were losing ground and falling apart. It’s during this low point in the Assyrian Empire, and also the low point spiritually in the northern kingdom, that God calls Jonah to go and preach repentance to Nineveh (this key city in the Assyrian Empire), which is right smack dab in the middle of the Assyrian Empire. For those of you who aren’t familiar with Jonah here is the story of Jonah in a nutshell. If you are familiar consider this a refresher. Chapter 1 – God’s call to Jonah to go and preach repentance to Nineveh and Jonah’s response. His response was to run away from the LORD and not go to Nineveh because he didn’t like them. These are Assyrians and the Israelites don’t like Assyrians. 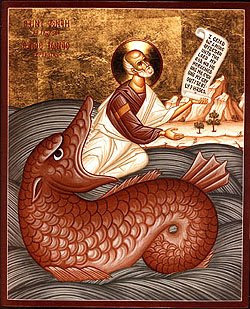 He tries running away from God by boarding a ship bound for Tarshish and ends up being tossed overboard and swallowed up by a great fish. Chapter 2 – Jonah is inside the great fish and we find him praying to God Chapter 2 is his prayer to God and ends with the fish vomiting Jonah onto dry ground. Chapter 3 – God’s call to Jonah to go and preach repentance to Nineveh and Jonah’s response. This time he listens and goes to the great Assyrian city of Nineveh and they listen to his message and repent. As a result, God relents from destroying them. Chapter 4 –Jonah becomes angry because God had compassion on them. God rebukes Jonah for being angry with Him for sparing the Ninevites. Any additional thoughts or comments about this introduction stuff is welcome! I'm trying to get back in the saddle after a week of vacation. I really don't have anything to report or share this week. We had a blast up in Michigan. I really enjoyed taking Claire swimming in Lake Michigan. It was a great time. We went to Mars Hill (Rob Bell's church) on Sunday. That was a quite an experience. I'll have to share more later. I'm going to be preaching again this Sunday. I'm actually preaching twice, once out at our State Park for a service and then in our regular AM worship service. I'm still studying the book of Jonah and will be preaching from chapters 1 and 3 on hearing God. Some really good stuff in the book of Jonah when you really dive into it. I'm on vacation this week. Taking the family up to Lake Michigan to do a little swimming. I'll be back next week with a message from Jonah 3:10-4:4. Here's part 2 of what Jonah learned about prayer while in the belly of the fish. What do we do when we find ourselves in troubling situations? How do we respond? Do we pray? Why is it that in times of trouble we find it easy to pray? In his time of trouble Jonah called (or prayed) to the LORD (v.1). I think he learned that times of trouble present us with great opportunities to draw near to God. I was thinking about our situation in America right now with so many people being out of a job and/or laid-off of work. These are times of trouble. We are in a belly of the fish moment. Could it be that God has allowed this to happen (He hasn’t caused it) because He wants us to seek Him out in prayer? He knows that if we are in times of trouble, or in the belly of a fish, we will hit our knees in prayer. We have become so busy (with our work and activities) that we just haven’t had time to seek first the kingdom of God, so He has allowed us to be swallowed by a great fish. Like Jonah, He is allowing and giving us time (Jonah had 3 days of solitude in the belly of the fish) to spend seeking Him through prayer. The question is will we take advantage of it? Will we let these times of trouble drive us to our knees or drive us further away from God? I hope we will respond like Jonah and seek God in prayer. Sometimes I think we feel guilty because we only pray in times of trouble. We use God like a band-aid. We only turn to Him when in trouble. I’m not saying we should continue to live like that because we miss out on so much, but I think God lets us use Him in that way to draw us near to Him and help us see that He can be trusted. That He is a good God. He has our best interests in mind. Times of trouble are great times to pray. I hope and pray that during those times you can discover what the psalmist of Psalm 139 discovered. Re-cap of what Jonah learned about prayer from his time in the belly of the great fish. 1. No matter where we are God hears our prayers. 2. Times of trouble are great times to pray.